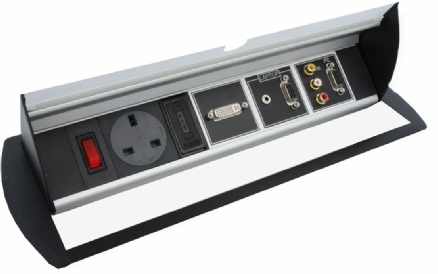 Flip top horizontal Desk Access Module. Constructed from an aluminium extrusion it has 150mm of available space for 6 x 25mm or 3 x 50mm Euro Panels. Select your requirements from our extensive range of Euro Panels to suit your application. It is supplied complete with a 13A socket and a fixed 2m mains cable. 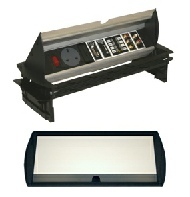 ( Schuko, CEE7 and IEC alternatives available to order ). For mounting only a 323mm x 132mm cut out is required.